No idea has captured the imagination or expressed the hopes of Arabs in the twentieth century as has Arab nationalism, and perhaps no subject has received so much attention from historians of the Middle East. But, while many historians have explored its intellectual sources, few have considered the social and political environment in which Arab nationalism evolved as an ideological movement. This study attempts to correct the imbalance and, in the process, provides a fascinating interpretation of the rise of the ideology of nationalism within the Arab world. 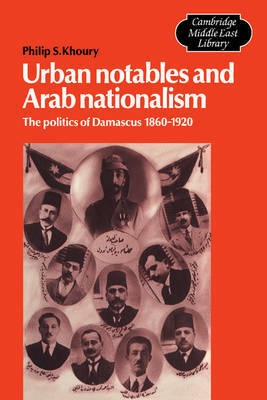 The book focuses on the social and political life of the great notable families of Ottoman Damascus, who, before World War I, played a crucial part in translating the idea into political action. Dr Khoury explains how such long-term factors as the Ottoman reformation, European economic expansion and agrarian commercialization in Syria encouraged rival and socially differentiated networks of influential families to merge into a cohesive upper class. Under the umbrella of a reinvigorated Ottoman central authority, this class of landowners and bureaucrats produced a new urban leadership, which dominated local politics after 1860.